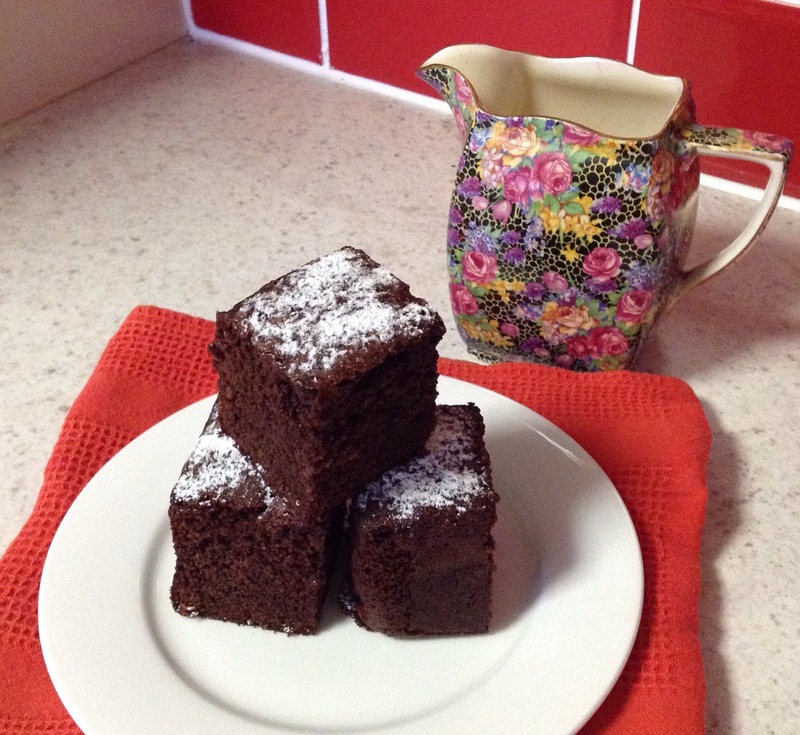 Do you like your brownies dense and chewy or tender and cake like? I like the latter, especially when they rise like these ones and here is my recipe. Preheat oven to 180degC and line a 20cm square cake pan with baking paper. Combine butter, water and cocoa in a pan over a medium heat until butter is melted. Remove from heat and cool. Beat sugar, eggs and vanilla in electric mixer until light in colour and thick. Stir in cocoa mixture and sifted flours and pour into pan. Bake for approximately 30 minutes until a skewer inserted in the centre comes out clean. Cool in the pan. Remove and cut into 16 pieces. Made this yesterday, one of my go-to slices. I should have taken some photos when it looked perfect, I know. But the family were too quick and now it is nearly all gone …. well, it definitely will be gone as soon as I make a coffee! This is my take on a recipe which I saw on Masterchef Australia probably about 4 years ago and have been making ever since. If you like salted caramel + chocolate + nutty, crumbly base – you are going to LOVE this! Preheat oven to 180C. Grease a 28cm x 18cm pan and line with paper extending on short sides to help remove slice. Mix flours, nuts and sugar together, add melted butter and press over base. Bake for 20 minutes and allow to cool whilst preparing the filling. Stir golden syrup and sugar in saucepan over medium heat until the sugar is dissolved Bring to a simmer and cook for a minute, remove from heat and quickly add the butter, condensed milk and salt. Return to stove and cook for 5 minutes until slightly thickened, stirring continuously. Do not allow the mixture to boil. Pour over base and bake for 15 minutes. Allow to cool. Place all ingredients into a heatproof bowl over a pan of simmering water, and stir until the chocolate has melted and ingredients are combined. Pour over caramel, sprinkle with extra salt flakes and refrigerate until set. Remove from pan and cut into slices. Makes approximately 24. Today is ANZAC day, so what better way to celebrate the day than to make a batch of Anzac Biscuits. Well, on second thoughts, there are other ways, one of which was apparently enjoyed this morning at the local RSL Club after the dawn service, by drinking liberal amounts of rum in milk for breakfast! Rum for breakfast – I don’t think so! Anyway, back to the baking. These biscuits enjoy a long history in Australia, and if you are interested to find out more, go here. Preheat a fan-forced oven to 175C. Line 2 baking trays with baking paper. Place first 5 ingredients into a large bowl and mix. Place butter, golden syrup, bicarb soda and water into a saucepan and stir over medium heat just long enough to melt the butter. Pour into dry ingredients and lightly mix in. Place teaspoons of mixture on to trays leaving room for spreading. Bake for approx. 15 minutes until golden brown. Leave on the trays for a few minutes before cooling on a wire rack. Store in an airtight container. Note that the mixture should be moist enough to form into a mound. If it is too dry to hold together, just add a little water to bring it to the correct consistency. Also I like to use a small ice cream scoop to get the biscuits the same size. This is what I served up to my guests today for dessert. With such hot weather, who doesn’t love ice cream? This is combination of a chocolate biscuit base, chocolate ice cream, hazelnut spread, vanilla ice cream combined with crushed chocolate honeycomb, more hazelnut spread, the rest of the chocolate biscuit base and finally caramel, honey and macadamia ice cream mixed with caramel popcorn. 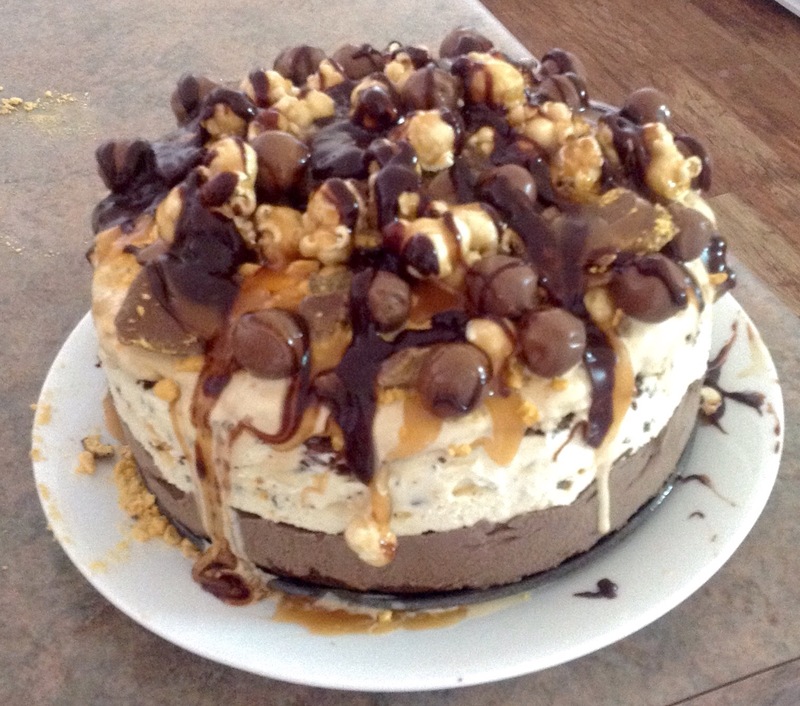 After it was left to freeze overnight I covered it with more crushed choc honeycomb, caramel popcorn and maltesers, and just for good measure, chocolate sauce AND salted caramel sauce. It tasted as good as it looks – everyone loved it! This was adapted from a recipe in a Family Circle magazine.